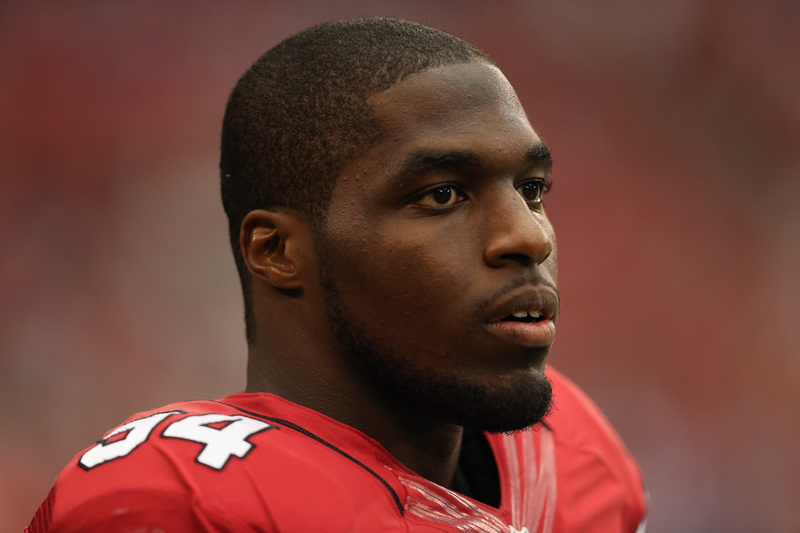 Even though he's only been in Chicago since Sunday night, Sam Acho feels at home within the Bears organization. The 26-year-old outside linebacker signed a one-year deal on April 1. He arrives in Chicago after four seasons in Arizona where he recorded 124 tackles, 13 sacks, seven forced fumbles and three interceptions over 51 games. A fourth-round pick out of Texas, Acho had previously been to Chicago only one time in his life 10 years ago where he said he made a stop at Giordano's Pizza. Now Acho will have to adjust to the cold temperatures that the windy city brings, but he is excited for the next step in his career regardless. The Bears are in the middle of a major transition with general manager Ryan Pace replacing Phil Emery and head coach John Fox replacing Marc Trestman along with a new coaching staff. Acho fits the bill as a player who can help in a big way during a transitional period. “Two years ago I was playing in Arizona and they brought in Bruce Arians and a completely new staff and a bunch of new players, he said. "We went from 5-11 to 10-6 then 11-5 and made the playoffs last year." Walking into Halas Hall for the first time was an awesome experience for Acho, who said the atmosphere and the history in the building stood out. The first voluntary workout began at Halas Hall on Monday where the big story was running back Matt Forte's absence. Acho said "yes and no" when asked if it's a big deal if a player misses the workout. "Every player has a different situation, he said. "Sometimes contract negotiations or sometimes there’s some serious thing going on with the player. I can’t speak on the situation since I don’t know." Getting acclimated within the Bears locker room hasn't been too hard for Acho, who prides himself on being a positive influence to his teammates. He knew kicker Robbie Gould from training with him over the past few years in Arizona and defensive end Lamarr Houston was his teammate at the University of Texas. Acho is one of 12 new additions this off-season, including the eighth defensive player. In terms of fitting in with the Bears, Acho believes playing in the 3-4 scheme is more than just a matter of fit. A one-year, prove it deal has been a theme for Pace this off-season, but Acho doesn't mind even though he has to go and start from scratch once again. “Coming into it my mindset has always been that it doesn’t matter if I get a one-year deal, a five-year deal whatever," he said. "I’m always going to play hard. That’s always been my mentality and I think that’s helped to get me to where I’m at today. But to be totally honest accepting a one-year, prove it deal it really does add a little bit of an extra chip on your shoulder because it’s something that you know you have one shot with the team, a new chance you have to go prove to players that you don’t know." In his first two seasons, Acho made 26 starts which included 11 sacks, five forced fumbles and a fumble recovery. He added a career-high seven sacks in his rookie campaign in 2011. However, a broken left fibula limited him to three games in 2013. Acho technically only made four starts at strongside linebacker aka SAM backer in 2014 in 16 games. He explains how Todd Bowles' defense features numerous fronts. “I was the starting SAM linebacker, but we had different packages. A 4-3 front and a 3-4 front," he said. "It just so happened that a lot of teams that we played last year were passing teams and we started off the game in the four-man front as opposed to our 3, 4 or 5 front." Acho really hit his stride in the season finale against San Francisco where he recorded the lone team sack on quarterback Colin Kaepernick along with three tackles. In the NFC Wild Card game against Carolina the next week he added seven tackles, one sack and a forced fumble in a starting role. "I’m excited about the opportunity to have a team that says "you know we saw what you did and we want to see if you can build on that," he said. "Yes, I can build on it. I’m paired with hungry players who are excited to do more just like I am and it’s great to be a part of." In his senior season at Texas, Acho posted 59 tackles, nine sacks, five forced fumbles and five fumble recoveries. Perhaps the best Bears cornerback and turnover guru in team history Charles Tillman leaves behind a legacy with his 42 forced fumbles over 12 seasons in Chicago. With Tillman now in Carolina, Acho would love to be the guy to fill the void in terms of creating turnovers. “Peanut was a guy who I loved watching even as a linebacker I loved watching his ability to get the ball out," he said. "That’s somewhat of a lost art in the NFL. That’s something I try to do with every tackle I make I try to strip the ball out or punch the ball out. I know if I got the Peanut Punch it might take some time to develop. But that’s something I’ve done at all levels." Sam and his brother Emmanuel, who is a linebacker for the Eagles both stand at 6-foot-2 or higher and that is a major blessing for both of them. “My dad claims that he's 5’8”, but he's probably 5’7”. My mom is 5’6” and yet my brother and I are 6’2” and 6’3” and it’s a major blessing," he said. "I’m a man of faith so I believe my talents are a gift from God. As a player you have different strengths and one of the strengths that I have you can call personality, my mindset or leadership whatever you want to call it but being able to influence people is what it comes down to. I want to be a positive influence on my teammates and help turn this organization around. " Acho graduated with Business honors at Texas and in 2010 was named by Sporting News as one of the 20 Smartest Athletes. The notion that football players aren’t smart or if you’re smart you’re probably not a good football player is one that Acho completely disagrees with. Acho's favorite player to watch prior to joining the NFL was Julius Peppers. Now he'll play next to another great in Jared Allen. Currently, the Bears have eight pure linebackers on their roster with Pernell McPhee, Mason Foster, Jon Bostic, Christian Jones, Shea McClellin leading the way. Also, five other defensive ends Allen, Houston, Willie Young, David Bass and Cornelius Washington will be used as pass-rushing linebackers and have roles under Fangio. Acho who also excels against the run and has experience playing defensive end, defensive tackle and linebacker in college doesn't shy away from what he calls an "underdog" role. "Part of me said I want to go to a place where I compete and fight and earn a spot and I’ve done that at different levels where I've been kind of seen as an underdog," he said. "Why Chicago though? I love competing and I love the challenge I know what I can do. I want to go showcase it." He had the same mentality going into free agency that he did when he was drafted in the fourth round of the 2011 draft by Arizona. Which was simply wanting an opportunity. "I was told I was going to be drafted higher and I think every NFL player has the same story," he said. "It’s not about the money, but I do want the opportunity to use the gifts that I have on a national platform on a national stage. I was so grateful when Arizona called in the fourth round and at that point it didn’t matter what round it was. I just wanted a shot, an opportunity. I got that shot once again and now I’m ready to run with it." Acho starred at St. Marks High School in Dallas, Texas where his head coach Heyward Lee once called him a phenomenal person. He says his biggest learning experience from his time there was "that it doesn’t matter what people say about you whether they believe in or they doubt in you. None of that matters. What matters is you have to believe in yourself." "I came back from a couple of football camps with my tape on Rivals and went from being a nobody to one of the top recruits in the nation," he reminisced. "I told my high school teammates that I just got a call from Mack Brown at Texas and he offered me a scholarship and the guy pretty much laughed in my face and said "no you didn’t your lying." I was kind of taken back. Even certain coaches said that we know you have an offer from Texas, but if you go there you’ll get lost in the shuffle you should go to a smaller school. Don’t aim so high." Acho plans on continuing to be a role model on and off the field. He got married over a year ago and has a three-month-old, soon to be four-month-old son, so his setting an example is key for him. “Ultimate goal as a football player. Number one on the field is to play to the best of my ability," he said. "People always say leave it all on the field and that would be the goal. To play to the best of my ability even more than that. Off the field and in the locker room setting the example. There a lot of 20-year-olds that don’t know which way to go and I want to set an example and say hey you can do it the right away. You can be faithful to your wife, you can be a good dad and be a constant professional." After such a down year in terms of football on and off the field, the Bears need a leader in the locker room. Acho can be just that as a smart and gifted player. He will provide a much-needed presence in Chicago. Make sure to follow Sam Acho and everything he does on Twitter (@TheSamAcho) and check out his website (samacho.com).